Recently, I was caught up in a fascinating Twitter debate. The burning issue concerned the subject of order . To be more specific, it was about the correct order in which to assemble the ingredients for a cup of tea. Now, bearing in mind that the participants in this discussion were mainly British, the debaters fell into two broadly opposing camps: the first camp contended that milk should go into the cup before adding freshly-brewed tea; the second (clearly less-discerning) camp argued the opposing case, namely that milk should be added only once the tea had already been poured out. As you might imagine, this debate quickly heated up, even before the tea itself had a chance to become cold. Order , it seems, is important, especially perhaps when making a cup of tea. This is also true for other areas of life. If you have never seen the YouTube clip of British comedian Eric Morecambe playing the Grieg piano concerto, conducted by André Previn, you should look it up. After several false starts, the deadpan Morecambe, wearing trademark heavy spectacles, makes his grand entrance, a cacophony of garbled notes over an oom-pah, oom-pah bass. André Previn stops the performance. You’re playing all the wrong notes, he says, angrily. Eric’s reply? I’m playing all the right notes…just not necessarily in the right order. What does it mean to set things in order …? Turning to this morning’s Gospel, taken from the end of the second chapter of Mark, we are given a clue. Here we encounter the Pharisees, that group of strictly religious Jews who were totally obsessed with order. I must confess I have some sympathy with them. Anyone who has seen the inside of my refrigerator or ever looked at a choir schedule knows how my mind works. I just can’t help it. However, the Pharisees go way further in their obsession for order, seeing it not as a means to an end, but rather as an end in itself. More specifically, in this passage, keeping order through strict observance of the Sabbath becomes the twisted vehicle by which they plan the bringing of capital charges against Jesus. Again [Jesus] entered the synagogue, and a man was there who had a withered hand. They watched him to see whether he would cure him on the sabbath, so that they might accuse him. I mean, how much more mean-spirited can you get? And what a marvelous image: the Pharisees, lying in wait, consumed with bitter jealousy, motivated by fear. Into their sights steps Jesus, and a hapless guy with a withered hand. It almost feels like they planted him there. And talk about trying to set Jesus up for failure! Interestingly, I looked up the Greek translation of the phrase that they might accuse him, and guess what? The Greek word Mark uses is ‘katēgoreō’, which is from where we get our English word categorize. Clearly, this kind of order, of categorization, of accusation, should carry a Government Health Warning. It can, and, in the case of Jesus, soon will, lead to death. Going back to the story then, how do we solve such a conundrum? Is it legal to heal on the Sabbath, or not? How does God’s order differ from ours? Is one needed to reveal the other? Do not think that I have come to abolish the law or the prophets; I have come not to abolish but to fulfill. This gives us a clue to what we see happening in this scene. Stretch out your hand, Jesus commands the paralyzed man. The healing, when it comes, is instantaneous, accomplished with a Sabbath-compliant command and a simple obedient gesture. Later in this service, we will recognize our four graduating choir seniors. It’s a rite of passage, a recognition of the years of selfless dedication and submission to rhythm and routine. Together they have spent countless hours in rehearsals, services, and concerts. They have been united by the compact between singer and choir, in which the individual is subsumed so that something greater might be revealed. Bonds of community are formed, which, together with the music they produce, become outward and visible signs of inward and spiritual grace. Together, these seniors have grown and participated in an activity which has the power to proclaim God’s love through music, word and action; and we have been the beneficiaries. You’ll understand what I mean when you listen to Philip Moore’s setting of Come, my way, my truth my life. This piece was written by Philip in honor of our graduating seniors. You’ll be able to hear it for yourselves shortly. Philip was unusually excited about the piece, when he first played it to me two weeks ago. He told me it’s written using only major chords. When I asked why, he replied it’s always good to set yourself a challenge. It’s always good to set yourself a challenge. As you’ll hear, by restricting himself to specifically major chords, Philip creates music that is achingly beautiful. He sets a seemingly simple melody afloat over gently shifting harmony, breathing fresh life into George Herbert’s poetry. Text and music combine in perfect symbiosis, and both speak eloquently of the profound connection between order and freedom, rule and creativity. Now we know that one is indeed needed to reveal the other. Adhering to a musical scheme, following a complicated choir schedule, or perhaps saying the daily office: these are all ways of ordering that require a kind of faithfulness and submission. Often, these things don’t feel particularly comfortable or rewarding. But they can provide us with the kind of structure that is prerequisite to greater things. Jesus shows us that this can serve as a means to an end, and not, as the Pharisees would so mistakenly have it, as an end in itself. Indeed, sometimes structured order can allow space – liminal space – into which the Holy Spirit of God can tumble, renewing and creating. I see concrete examples of the Holy Spirit at work at Christ Church Greenwich. 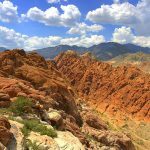 Since today is the last Sunday of the choir program year, it’s also perhaps a good time to take stock, to look back at the past year and to discern evidence of the hand of God at work. When we do this, we soon realize that this instructive exercise has revealed the emergence of the green shoots of growth everywhere. And, of course, this is not something that we have accomplished ourselves through our own effort; it is rather the fruit of our corporate faithfulness to a shared life of liturgy, community, prayer, and service. Looking ahead, as the congregation of Christ Church continues to engage in so many ways, giving of time, talents, and treasure, I’m sure that remarkable things will continue to happen. Reaching beyond our doors, we will continue the faithful work of visiting the sick and housebound. Others will continue the important work of searching for a new rector. Others still will continue to produce liturgy with care and diligence. Some will prepare the church in other ways, like committee work, counting, or cleaning. Further afield, our choirs will set off on a tour to England where they will sing at the cathedrals of Winchester, and St Paul’s, lifting their voices and the hearts of others to God through musical worship. Whatever our role, this will be a busy and active summer, a chance for us all to remain faithful to Christ Church, to attend regularly, and to invite others to share the good news that is to be found here. Our final hymn today is one of the most well-loved in our Hymnal. The text of Come thou fount of every blessing was written by Robert Robinson, an English Methodist preacher who converted to Christianity in the 1750s. The American folk tune Nettleton to which it is set was new to me upon moving to the United States, but is fine enough to be used extensively by composer Charles Ives, appearing in a string quartet, a piano quintet, and a song. 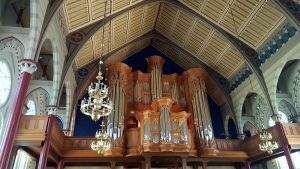 Tuning the heart – what an amazing notion, the idea that our hearts can be tuned in the way that a piano or organ can, in order to sing the praises of God. And that’s all it takes: hearts in tune; minds open. Faithfulness to each other as members of a journeying community, and trust in God. As our seniors move on to the next stage in their lives, and as we embark upon a new chapter here at Christ Church, may we also learn to tune our hearts to sing the praises of God, whose divine order transcends more than we can ask or imagine . Now the serpent was more crafty than any other wild animal that the Lord God had made. He said to the woman, ‘Did God say, “You shall not eat from any tree in the garden”?’ The woman said to the serpent, ‘We may eat of the fruit of the trees in the garden; but God said, “You shall not eat of the fruit of the tree that is in the middle of the garden, nor shall you touch it, or you shall die.” ’ But the serpent said to the woman, ‘You will not die; for God knows that when you eat of it your eyes will be opened, and you will be like God, knowing good and evil.’ So when the woman saw that the tree was good for food, and that it was a delight to the eyes, and that the tree was to be desired to make one wise, she took of its fruit and ate; and she also gave some to her husband, who was with her, and he ate. Then the eyes of both were opened, and they knew that they were naked; and they sewed fig leaves together and made loincloths for themselves. For some time, scientists have been developing increasingly powerful telescopes. By launching them into the vacuum of space, they are able to escape the Earth’s polluted atmosphere to look at stars that were born as long as 15 billion years ago. The most famous of these giant telescopes is Hubble, and its far-sighted range is known as the Hubble Deep Field. Cosmic events in this arena ripple through space and time, leaving echoes of themselves in everyday phenomena such as radio waves and gravity. The garden in Genesis 3 is rather like the Deep Field of theology. Here, we encounter the fundamental human need for knowledge, and witness events that give way to the birth of morality. Paradise is ruined in a single moment (a singularity, if you like) when the woman and man are first introduced to the inexorability of time’s forward movement. Their practical response to this philosophical and ethical mystery is the primitive foreshadowing of our relentless modern scientific pursuit of a Theory of Everything. Guilt, pain, remorse, and pursuit: these echoes from that first singularity resonate throughout history and science. As Christians (and perhaps as scientists too), this dissonance can only find its resolution in Jesus Christ, crucified, risen, and ascended. For when time itself comes to an end, he will be enthroned, in the end, as Lord of all time. I am reminded of this as I read the story of the Samaritan woman. Jesus and the woman encounter each other in the heat of the day, away from the Jewish crowds, and alone. The disciples have gone in search of (sickly?) nourishment elsewhere. Divinity (with a human thirst for water) meets humanity (with a quest for divine connection) across the void of a deep well, a space that is quiet, transformative, and holy. At its best, liturgical worship offers such space. It yields to the limits of language. It uses art, poetry and music to express the ineffable beauty of the Creator, and our aching desire for communion with God. It stands in silence, acknowledging both the presence of the divine, and the presence of divine absence within our thirsty souls. Recently, I’ve been talking with choristers about the importance of the Eucharist, and its pivotal place in worship. There has been some lively discussion, and I’ve been impressed by the deep appreciation of our youth for something so mysterious that it stands outside the world of words. At the 11.00am service this morning you’ll hear Bread of the World, in Mercy Broken, a text especially set for the St Cecilia Choir of Girls. The quietest organ chord (played high up on the strings) follows its closing words, ‘heavenly food’. This is meant to signify the only acceptable response to the proposition that humans consume the Bread of Life: awestruck silence. For how can this truly be possible? Let us enter the desert this Lent. Let us acknowledge that hunger deep within us. Let us meet God in worship that is quiet, transformative, and holy. This past summer I was fortunate to attend the Gothenburg International Organ Academy, an annual meeting of world-renowned scholars, teachers and organ-builders on the west coast of Sweden. The overarching theme of the week was exploring the pictorial in organ music, chiefly through two different organ schools – the French school, focusing on the works of Olivier Messiaen, and the North German Baroque school, focusing on the themes of battle and lament in organ music of the late 17th and early 18th centuries. These offerings were supplemented by workshops on the art of silent movie improvisation, a close cousin to the accompaniment of the liturgy, where one is often called to instantaneously compose music reflecting action, drama, and mood. Presentations and concerts complemented these workshops and lectures, providing an extremely rich and inspiring menu. 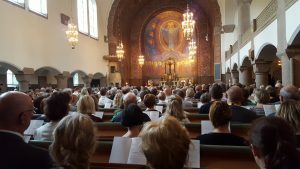 In a happy coincidence, this year’s academy took place concurrently with the annual meeting of the Scandinavian Church Music Symposium, a convocation of 1,400 church music directors, organists, and priests from Norway, Sweden, Iceland, Denmark, and Finland. To someone who had lived and worked in Norway for more than three years, this provided full re-immersion into the moving worlds of Scandinavian hymnody and folk melody, as well as the perfect opportunity to speak in a quirky west coast dialect! Musically, two sources of enlightenment stood out from the artistic riches of the week. The first was a glimpse into the sound-world of the North German Baroque. This was eloquently revealed during the 20 or more hours spent listening to the the North German baroque organ in Örgryte New Church. This remarkable instrument recreates the exact construction techniques and design philosophies of the famous 17th century German organ builder Arp Schnitger. It is tuned to a special system known as quarter comma meantone. Although this can sound quite foreign to modern ears, it has two major advantages. The first is that for the majority of keys, certain chords sound exactly in tune, since they are not compromised by being adjusted in order to ‘fit’ into the modern scheme. The second is that a small minority of keys do not sound in tune to our ears at all! Chords played in keys at the periphery of composition at that time (such as F sharp major) sound bitter and haunting, even wild. As I sat in Örgryte Church, soaking up the music, it was refreshing to be reminded of the potential of the organ to move hearts and minds in this way. I have often regarded the organ as the heartbeat of the musical life of any church, containing the power to enfold a congregation with warmth and color, delight an audience with dynamism of sound, and uplift worship with strong foundational support. The organ in Örgryte does all that, and more. Which brings me onto the second source of enlightenment during this remarkable week: attending the closing Eucharist of the Scandinavian Church Music Symposium. Although all Scandinavian church languages are similar (except Finnish, which is related to Hungarian), they are not exactly the same. They vary in cadence, syntax, and vocabulary. However, when 1,400 nordic church musicians come together to lift their voices in liturgical song, those differences are academic. Beginning with a Sami Joik, the service took us through the fjords of Norway to the volcanic moonscape of Iceland; it reminded us of the north European heritage of Denmark, and celebrated the folksong of Sweden. Together, we all joined our voices, aligning our melodies to the note of the organ, and committing ourselves to another year of musical service in our different congregational settings. Proclamation, community, and service, celebrated through the joint endeavor of music and song. Visionary new worlds, created in laboratories of sound. May these be our guiding lights, as we begin another year of music at Christ Church Greenwich. Content to bask in radiant glory. And now your gift is music’s story. Regarding shape of phrase and gesture. Suddenly. From the universe you passed. Too soon you turned our Lauds to Vespers. Absorbent, living halls of sound! Your temple is shattered. Its walls won’t last. God’s music escapes, returns to ground. Willing pilgrims, joined to thinking. Us. Our imagined future now is past. The sand we thought was firm is sinking. Heart broken friends, on Calvary. And clothed the sands of time with glory. In greater light, on different shore. Now in Jerusalem by the Sheep Gate there is a pool, called in Hebrew Beth-zatha, which has five porticoes. In these lay many invalids—blind, lame, and paralyzed. One man was there who had been ill for thirty-eight years. When Jesus saw him lying there and knew that he had been there a long time, he said to him, ‘Do you want to be made well?’ The sick man answered him, ‘Sir, I have no one to put me into the pool when the water is stirred up; and while I am making my way, someone else steps down ahead of me.’ Jesus said to him, ‘Stand up, take your mat and walk.’ At once the man was made well, and he took up his mat and began to walk. Now that day was a Sabbath. So the Jews said to the man who had been cured, ‘It is the Sabbath; it is not lawful for you to carry your mat.’ But he answered them, ‘The man who made me well said to me, “Take up your mat and walk.” ’ They asked him, ‘Who is the man who said to you, “Take it up and walk”?’ Now the man who had been healed did not know who it was, for Jesus had disappeared in the crowd that was there. Later Jesus found him in the temple and said to him, ‘See, you have been made well! Do not sin any more, so that nothing worse happens to you.’ The man went away and told the Jews that it was Jesus who had made him well. Therefore the Jews started persecuting Jesus, because he was doing such things on the Sabbath. But Jesus answered them, ‘My Father is still working, and I also am working.’ For this reason the Jews were seeking all the more to kill him, because he was not only breaking the Sabbath, but was also calling God his own Father, thereby making himself equal to God. I recently came across an article that argued that most novelists break through in middle age. The writer gave examples: John Irving, George Eliot and Gabriel García Márquez are all authors whose breakthrough novels happened in their forties and fifties. We sometimes encounter this phenomenon in other walks of life. For example, Anton Bruckner began composing in his forties, and César Franck completed his first symphony when he was fifty-six. In politics, Ronald Reagan first held public office at the age of fifty-five, and in the world of business, Colonel Sanders began deep-frying chicken in his sixties. These late bloomers spend much of their lives waiting. There are others too, who inevitably wait in vain. The man described in the episode at the beginning of the fifth chapter of John must have imagined himself in the latter category. The gospel writer is specific. The man had been ill for thirty-eight years. We are to know that he felt the weight of every single one. We are to feel his desperation and utter hopelessness. Upon encountering the sick man, Jesus meets the gloom head-on, and cuts through his despair with a simple question, “Do you want to be made well?” The sick man – we do not know his name – resorts to his usual pattern of behavior. Instead of answering Jesus, his reply comes as a verbal tic, a well-established rant, complaining at and against anyone who is able or willing to listen. Jesus refuses to be drawn into this web of misery. Instead, as so often in the gospel of John, Jesus uses the occasion to illumine the world with a sign of God’s glory. His command, ‘Stand up, take your mat and walk’, renders the paralytic speechless. And so, after thirty-eight long years, the man gives up complaining, takes up his mat, and walks. Whose voice would render us speechless? It is sometimes difficult to figure out, bombarded as we are with fragments of information from all directions. Frequently, we get caught up in media hype or everyday gossip. More often, I suspect, the voices we listen to come from our own childhood. It is there that we grow identity, and figure out the boundaries that will eventually define the mat on which we live our adult lives. It is during childhood that we gain a sense of life’s possibilities and, more significantly, its limitations. Jesus, however, is not interested in limitations. He is not even interested in our well-rehearsed complaining. Instead, Jesus calls us to refocus on the almost unimaginable possibility of a life without limit. He commands us to pick up the mat that would define our old life, and walk with him into limitless existence. He speaks with the supreme authority of one who will take up the ultimate mat of sin and fear – the cross. By his suffering and death, Jesus walks ahead of us through the gate of glory, and wins eternal life for all people. This should be enough to render us silent. Only once we reach that state, are we ready to receive the divine command, ‘Take up your mat and walk’. Now can we truly write that novel, fix that friendship, go for that run, or spend time with God in prayer. Whatever our response, it will be permeated with the same glory ‘as of the only-begotten of the Father, full of grace and truth’. May these words be for us a joyful hymn of praise this Lent, as we lay aside all that would hold us back, and journey together with confidence in Christ. “Everyone then who hears these words of mine and does them will be like a wise man who built his house on the rock. And the rain fell, and the floods came, and the winds blew and beat on that house, but it did not fall, because it had been founded on the rock. And everyone who hears these words of mine and does not do them will be like a foolish man who built his house on the sand. And the rain fell, and the floods came, and the winds blew and beat against that house, and it fell, and great was the fall of it.” And when Jesus finished these sayings, the crowds were astonished at his teaching, for he was teaching them as one who had authority, and not as their scribes. My friend Alan once appeared on a TV show. Rather unusually, the interview took place from Alan’s deck chair, on a deserted stretch of Norfolk beach, on the coast of eastern England. As he reclined facing the waves, Alan told the story of his house, which fell into the sea on that exact spot. This turn of events did not come as a major surprise to Alan, since coastal erosion has been a steady feature of life in East Anglia for centuries. Its potency is determined by various factors, including the power of waves, the angle of beach, and the composition of sea-facing rock. Up and down the entire coastline, houses and livelihoods have fallen victim to the North Sea. Perhaps the most dramatic example is Dunwich, former capital of the wool trade. At its height, in the 14th century, it was a port similar in size to medieval London. Its decline began in 1286 with a huge coastal storm surge, which set off a pattern of erosion across the centuries. Hundreds of houses were eventually swept into the sea, and eight churches found their final resting place at the bottom of the ocean. Today the population of the village of Dunwich is just 84. It is said that if you listen carefully, you can still hear the sound of church bells from under the waves. Clearly, location is important. Jesus understands this, and sets out to persuade his listeners. The wise man builds on the rock, the foolish on the sand. Floods are inevitable, their impact sudden and cataclysmic. To a first century Jewish Christian, this would have been a direct reference to the coming day of Judgment, which was expected to appear rapidly and dramatically. Twenty centuries later, contemporary Christian thought has largely abandoned notions of a sudden last Judgment, and we are left with the challenge of making sense of this story in the light of our own experience. The human condition can seem a lot more predictable to us, a perception bolstered by breakthroughs in technology and medicine. However, in spite of all these advances, houses are still falling off the coast of Norfolk into the sea. And, as a chorister recently remarked, “Life is just a short break from death”. 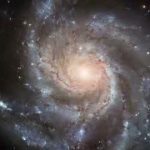 Our increasing ability to prolong existence also brings unique opportunities, for good and ill. Often these come through seemingly innocuous choices. It’s only once they’re placed side by side, in a vast procession of incremental steps, that we see the kind of character we’ve become. C.S. Lewis refers to the danger of this situation in The Screwtape Letters: “Indeed the safest road to Hell is the gradual one – the gentle slope, soft underfoot, without sudden turnings, without milestones, without signposts.” No drama here, just everyday humdrum decisions leading a person through the intricate maze of his or her own creating. The ultimate goal of the devils in Lewis’s story is to bury all believers with those eight churches at the bottom of the sea, without them ever really noticing it. And when Jesus had finished these parables, he went away from there, and coming to his hometown he taught them in their synagogue, so that they were astonished, and said, “Where did this man get this wisdom and these mighty works? Is not this the carpenter’s son? Is not his mother called Mary? And are not his brothers James and Joseph and Simon and Judas? And are not all his sisters with us? Where then did this man get all these things?” And they took offense at him. But Jesus said to them, “A prophet is not without honor except in his hometown and in his own household.” And he did not do many mighty works there, because of their unbelief. Familiarity breeds contempt: a saying that seems to apply easily to this story of Jesus’ encounter with his hometown family and friends. Throughout this Gospel, Matthew paints a picture, rich with reference to the Hebrew Scriptures. The first century audience for whom he intended his account would have appreciated the allusions and echoes of texts they knew by heart, in a sophisticated and nuanced way. These verses are no exception. Then he dreamed another dream and told it to his brothers and said, “Behold, I have dreamed another dream. Behold, the sun, the moon, and eleven stars were bowing down to me.” But when he told it to his father and to his brothers, his father rebuked him and said to him, “What is this dream that you have dreamed? Shall I and your mother and your brothers indeed come to bow ourselves to the ground before you?” And his brothers were jealous of him. As is so often the case, the Bible confirms what we already know. In a pattern that seems to repeat itself throughout history, visionaries are cast out. This can be as true for the worlds of philosophy and religion as for the spheres of science, music and art. Nineteen hundred years after the controversies created by the carpenter’s son, an altogether different young man created more than two thousand artworks. Only ever selling one painting during his short life, his work was ultimately destined to have a profound influence on Western art. 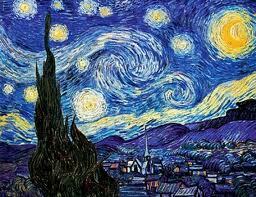 One of his most famous works, The Starry Night is on display at the Museum of Modern Art. In this iconic painting, Van Gogh depicts a wild sky, almost untamable. Heaven and earth shimmer and reverberate, casting the eye to and fro in a frantic search for the source of resonance. We are captivated by the vision of an incarcerated visionary, who, from the window of his sanitarium, depicts eleven stars, the same constellation dreamed by the outcast stargazer of Genesis. We become lost in the wonder of an eternal mystery, cast adrift in time and space. Then, suddenly, we see it. The anchor at the center, piercing the heavenly realm, yet firmly rooted in the ground. With its spire reaching up into the night sky, we see the church, the hands and feet of that first century outcast: Jesus. In eloquence beyond words, this humble building delivers a sermon, speaking clearly about a mission of presence, and of prophecy. Presence and prophecy: two aspects of Jesus’ ministry that his friends and family found hard to accept. Presence and prophecy: words for us, as we embark on the next phase of a capital restoration of our campus. As we update our facilities for the use of others, let us become Christ-like in our mission of presence. As we work to improve our church buildings for worship and teaching, let us become part of a mission of prophecy, pointing always to the Glory of God. And, together with dreamers, prophets and outcasts everywhere, let us invite the Holy Spirit to dazzle us with vision as perfectly clear as Vincent’s night sky. Once that happens, the only option will be to astound the whole world with wisdom and mighty works. If you’re are a regular visitor to Greenwich Point, you’ll know that, during the season of Epiphany, this fantastic natural preserve is enhanced by the presence of a growing mountain of Christmas trees. Beginning as a small gathering on the Feast of St Stephen, I’ve watched the phenomenon grow by the side of my regular running route. Along with the lengthening days and increasing solar elevation, this slowly increasing organic mass serves as a reliable guide to our steady journey, from Christmas through Epiphany, via Candlemas into Lent. Stripped of all their finery, I cannot help thinking that these once elegant trees possess a slight air of indignation. Perhaps they caught a glimpse of paradise in their bedecked states, basking in the tinsel-lit radiance of their cozy New England parlors. And now summarily stripped and cruelly tossed aside, they are left to fend for themselves in salty spray and winter gale. As the calendar turns from the Star in the East towards the grey skies of Lent, reality becomes painfully clear: these trees were destined to die the moment they entered our lives. But that’s not the end of the story. Across the country, Christmas trees are chipped to provide mulch and compost. They are used to stabilize rivers and prevent beachfront erosion. They are sunk in lakes to provide shelter for fish and habitats for insects. They provide enough oxygen nationally for the use of 9 million people. They feed the plants of Greenwich, and stabilize the soil in our parks. As it turns out, they give life in so many different ways. Ultimately, God’s Christmas tree is the cross. And yet through the death and resurrection of Jesus, the light that it sheds shines in the darkness, long after the tree is gone. Introducing his letter to the Romans, Paul sets out the background to his calling, and broadly defines the canvas of our salvation. The gospel of God is promised beforehand through his prophets in the Holy Scriptures. In part one of the drama, Jesus descends from David according to the flesh. In part two, Jesus is declared to be Son of God with power according to the spirit of holiness by resurrection from the dead. The incarnation of Christ is a necessary prerequisite to his suffering, death and resurrection. It’s a prescribed form, a cosmic ceremony. Benjamin Britten wrote ‘A Ceremony of Carols’ while on a dangerous sea journey from the United States to Great Britain, during the height of World War II. The work is a musical setting of Middle English poetry. A procession of plainsong themes, dance-like rhythms and delicate counterpoint, the piece affords the listener several unique perspectives on the mystery of the incarnation. Theologically, the Ceremony culminates in a ferocious battle between good and evil, the music expanding to paint a vivid picture of apocalyptic conflict – resonating palpably with Britten’s plight at sea. If you’ve ever watched the state opening of British Parliament, you’ll know that ceremonies can be marvelous occasions. It’s clear that they rely on total conformity to a prescribed form. Without this, they are at best untidy, and at worst chaotic, devoid of meaning. As we journey from Advent to Christmas, we are called to align ourselves with God’s prescribed form, and through the Holy Spirit allow His divine purpose to work through our lives. God risks everything in sending His Son to live among us. Benjamin Britten overcomes danger to create a work of enduring beauty. And now we are invited to step out into the perfect ceremony of new life in Christ, a divine dance that begins today, and lasts forever.